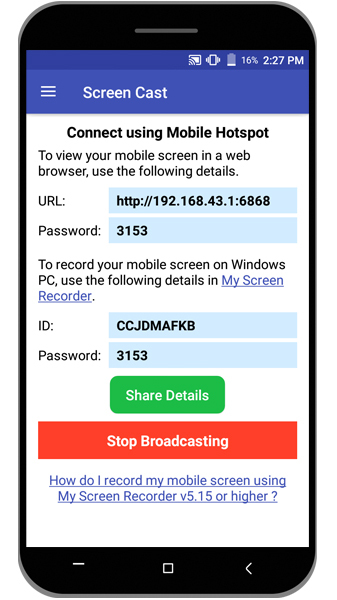 How do I use mobile hotspot with Screen Cast? Can I view my mobile screen on my PC even when I don’t have an Internet connection? Please help. 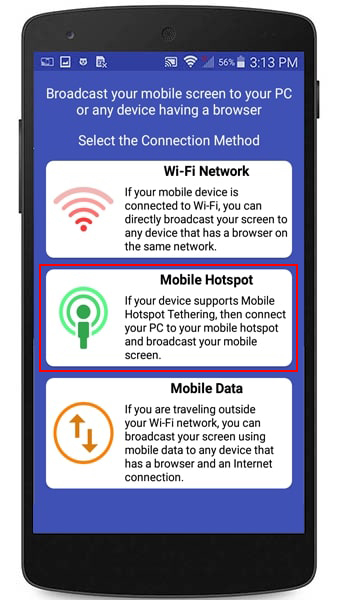 Screen Cast allows you to broadcast your mobile screen using a ‘Mobile Hotspot’ when you don’t have an Internet connection. First, open the Screen Cast application, select 'Connection Type' as Mobile Hotspot and click ‘Start Broadcasting’. Then configure hotspot from your mobile device settings. Note down the URL and password to connect. Next on your PC, turn on the Wi-Fi and select mobile hotspot. You should see your device's mobile hotspot network name in the Wi-Fi network list. Click on the hotspot created by your device and click the Connect button. Now, open a browser on your PC and enter the URL from your mobile device. You will see your mobile screen on the PC.